QuickBooks added the Live Community feature to enable people to get answers from the online Intuit Community Forums. For some people this slows things down, and it requires an Internet connection. 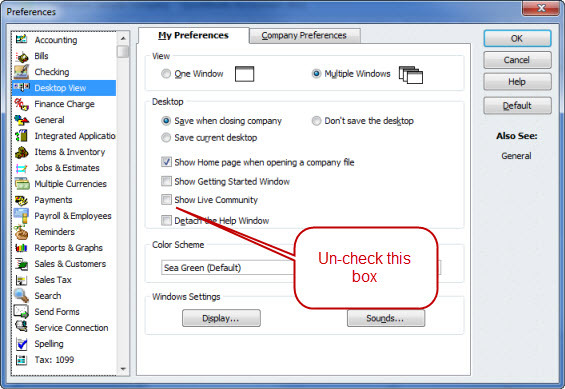 If you want to turn this feature off select Edit then Preferences, select the Desktop View preference, and un check the show live community box. Well, Nick, it works for me and most people – but some versions/editions/releases of QuickBooks have some bugs in them that create some issues. Note that this article was written in 2010, and the screen is from QuickBooks 2010. You should be on the R14 release for QB 2010, as older releases have bugs. QuickBooks 2012 handles this issue in a different way. But, it is similar, and it works for me. I had this problem spring up on me when I installed quickbooks 2012, and I was infuriated by it. I kept mucking around and did seem to fix it by fiddling with the ‘save current desktop’ options. I think maybe you have to turn the live community off as suggested above, then opt for One window, and Save current desktop as the only items to be checked. When you restart QB, then the Save current desktop option reverts to Keep previously saved desktop, but that is ok at that point because your desktop should now be clear. It may be that the saving of the previous desktop is what keeps bringing the Live community back. But if you save the current desktop once, with Live community off, then it might fix the problem. Murray, I’m guessing that you have the Canadian version? This article refers to the US version, and often we see that the Canadian version differs from what we have down here. I’ll note that in the US 2012 version this has been changed quite a bit, and this is no longer an issue. But that update hasn’t hit Canada yet. Live community can not be disabled since I installed the 2017 premier edition. Pain in the but!